I’m not a scientist. I’m a retired lawyer. I’m accustomed to looking at evidence which will prove or disprove a particular point. The evidence is proven by science that my description above is accurate physically and scientifically. The next question is, what does this all mean? It doesn’t take a scientist to consider the possibilities. Let me take you on a trip of imagination like none you’ve ever had. Look at the drawings of a single neuron of the human brain, the drawing of a single squid, shown at the beginning of this article. Especially notice the cup-like ends on the neuron and the suction cups on the squid. The squid is built on somewhat the same principle as the human neuron, except it has reproductive organs on one end, whereas the human neuron does not reproduce after it is mature. What you need to notice is that the squid is an individual life-form which handles its functions on its own, and squids are scattered throughout the ocean, running in schools yet never touching each other (except during reproduction or fighting, which the human neurons do not do). They live their lives with an appreciation for and affinity with all the other squids, yet they are each an independent organism separately programmed by DNA. It is generally accepted science that an individual human neuron cannot form either a partial or complete human thought. See, for example: http://www.johnhorgan.org/can_a_single_brain_cell_think__43703.htm . This does not mean each neuron is not capable of formulating its own plan within itself. Since each is a separate neuron, it may possibly have its own agenda as it communicates with other neurons. The human neuron, as an independent living creature, has suckers or suction cups at the end of each of many extremities. These suction cups are called synapses. These synapses are lined up to face toward each other, yet they never touch. The only way they share information is through the chemicals which are secreted from inside each suction cup and pushed across the space to the facing suction cup of another separate neuron. 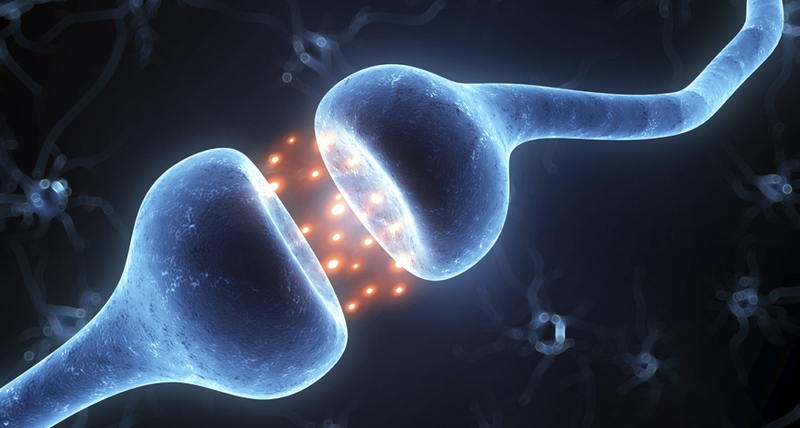 The picture below is an artist’s rendering of how each of the synapses looks and operates. They never touch. It is estimated that the total number of synapses, each one a small part of a neuron, in each human brain and nervous system is 100 trillion. Each synapse faces another, and none touches the other one. The balancing act for so many synapses facing each other and not touching is so vast as to be virtually incapable of description. Especially when you consider that each neuron and its synapses is a separate and self-contained living being, acting in its own way and supported by the glial cells which surround it. And yet, metaphorically, what do each of us really have in our brain and nervous system? A hundred billion extremely small “squids” swimming around in glial cells, each a separate entity and yet part of a larger “squid” colony. Another metaphor is that the neurons in each human body are like The Borg from Star Trek. The Borg are a vast collection of “drones”, or cybernetic organisms linked in a hive mind called “the Collective”, or “the Hive” (according to Wikipedia). The Borg travel together as a single entity through space [i.e., the surface of the earth for our neurons] and are much more powerful for all the individual minds [neurons] linked together. The lesson here is that each neuron is an independent, individual being, traveling like a school of squid side by side and end to end amid an ocean of glial cells, coming close yet never touching one another. The geometry of the human neural system which keeps synapses close yet not touching is like a collective or hive mind. It is not one thing. It is billions of individual entities apparently gaining strength by forming a “hive” in each human body. This hive is put together geometrically in such a precise formulation that 100 trillion related synapses face each other and yet don’t touch; and the same basic geometrical formulation exists in each of the seven billion people on the planet. Here are some more numbers which should be added to my description. In 2014, the American Academy of Microbiology published a story that recent research had arrived at an estimate of the number of human cells each person has – approximately 37.2 trillion. In addition, they estimate there are 100 trillion bacterial cells in each human body. How’s that for some big numbers? Each of those human cells is a separate living thing, and each bacterium is a separate living thing. The only comparable computation comes when we look at the cosmological descriptions of the universe made by our best and brightest scientists. It could almost be said that each of us has an entire universe inside our own individual nervous system and rest of our body and the bacteria which inhabit our body. And it is the same for each of the other of the seven billion separate human bodies inhabiting our planet. I’ll be back with more speculations later. Use your imagination to consider whether what we are told by scientists and our own eyes is really only a miniscule part of our total being. We actually are an entity made up of trillions of individual separate living organisms. Do any of these immensely small organisms speak for themselves, as opposed to being a passive chunk of human flesh? Consider your mind blown. From http://www.mcgeepost.com Copyright © 2017 by Michael H. McGee. All commercial rights reserved. Non-commercial or news and commentary site re-use or re-posting is encouraged. Please feel free to share all or part, hopefully with attribution.